The June 5th Democratic Primary is just around the corner. 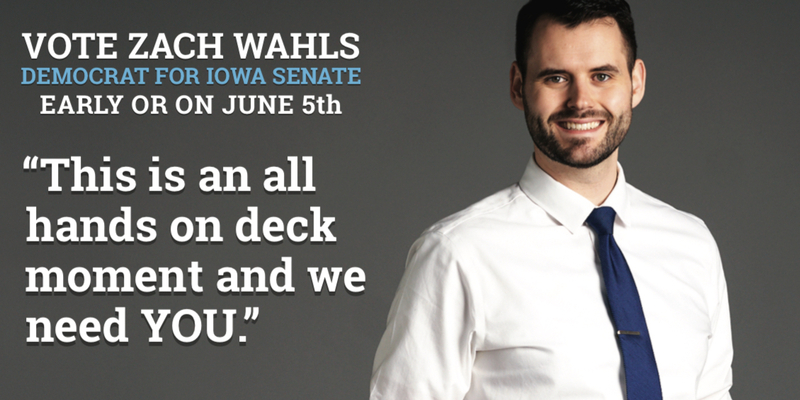 There are several things you can do to help ensure that we send Zach Wahls to the Iowa Senate. First and foremost — VOTE! You can vote early at the county administration buildings most weekdays and at several satellite locations. More info on early voting below. You can also vote on Tuesday, June 5th. Find your polling place now. You can also help the campaign by making sure others vote for Zach. Here are some quick and easy ways you can get involved. We are hitting the streets and getting out the vote throughout Senate District 37. To sign up for a door-knocking shift, complete this simple form. If you’d prefer to make phone calls on Zach’s behalf, get started now using our handy online tool. Voting will also be available at the Auditor’s Office the weekend before the election: Saturday, June 2nd (8–5) and Sunday, June 3rd (noon–5).